Not all of you reading this are designers, but all of you have workspaces. And we want to see yours! 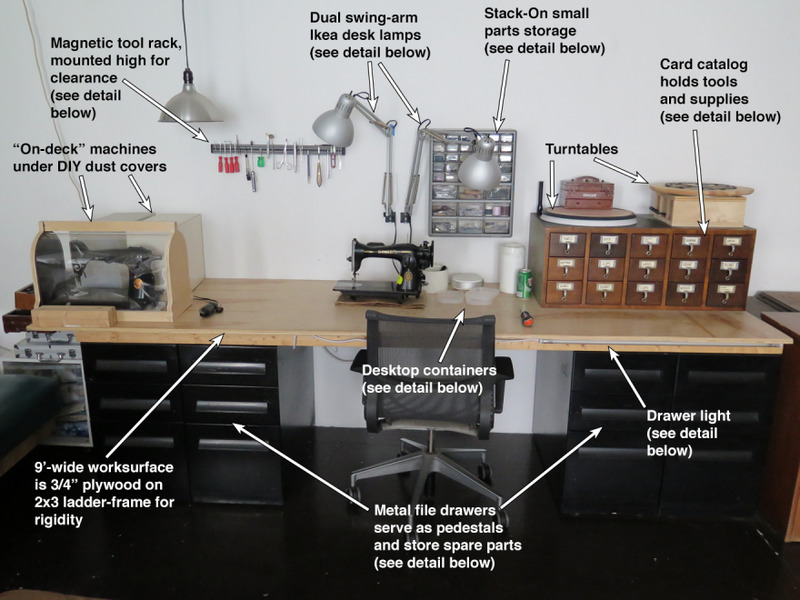 Whether it's a desk, a studio space, a workshop, a laboratory, a kitchen, et cetera. Send us some photos marked with call-outs or annotations explaining your work-related objects in the photos, and you'll be entered to win one of Joey Roth's laser-engraved Woodblocks (details below). Four of you will take home a prize! 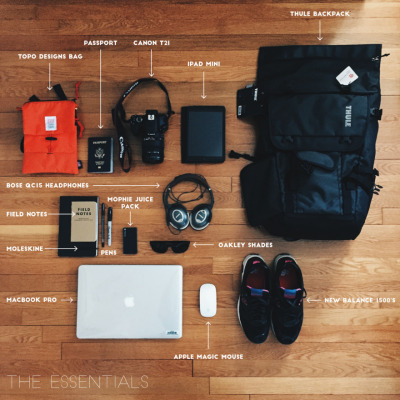 Please e-mail your photos to core77editors *at* gmail -dot- com, subject line "WORKSPACE CHALLENGE." 4. Don't forget those call-outs or annotations! 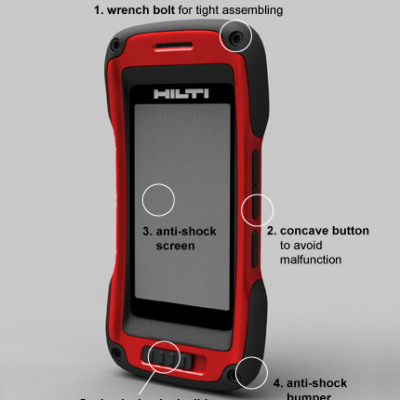 This contest is not industry-specific, and any Core77 reader can enter. 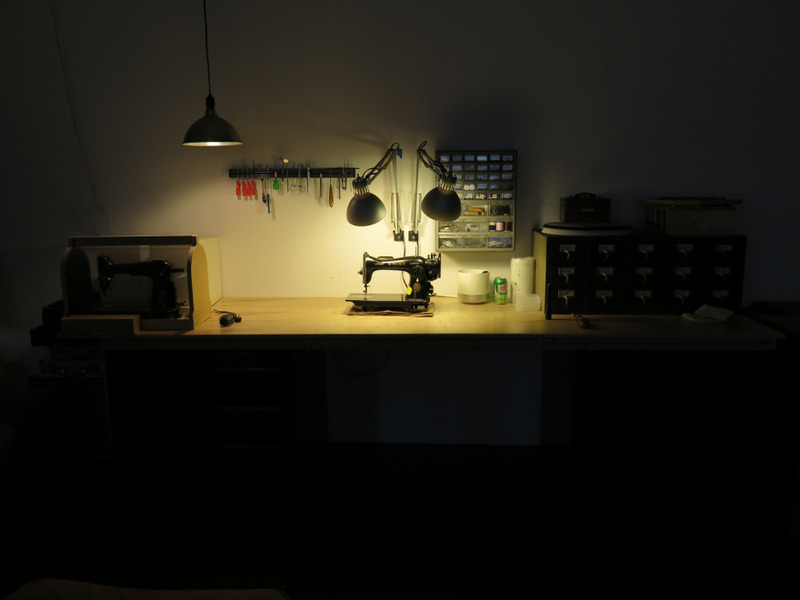 Since I no longer have a design studio space, I've photographed my sewing machine repair workstation, below, as an example of what you can submit and how you might want to present it. I just whipped this up a few minutes ago, so surely you can do better than that! 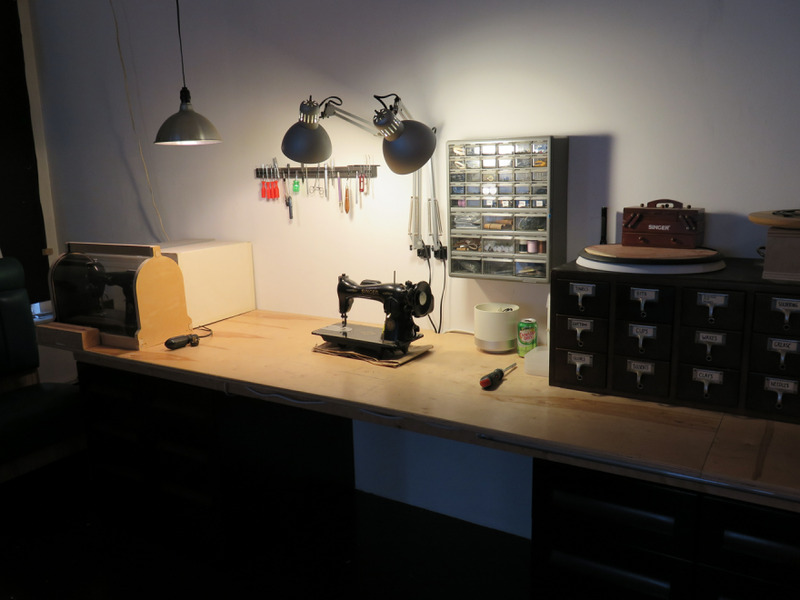 This self-made workstation is where I repair vintage sewing machines. I have over 40 machines and some of them weigh 30 pounds, being cast-iron, and I may have up to six machines on the bench at a time, thus it needs to be sturdy. I didn't have much money so I built it out of 3/4" ply affixed to a 2x3 ladder-frame for strength. So far it doesn't flex. I hit the front edge with a 3/8" roundover bit to break the edge. 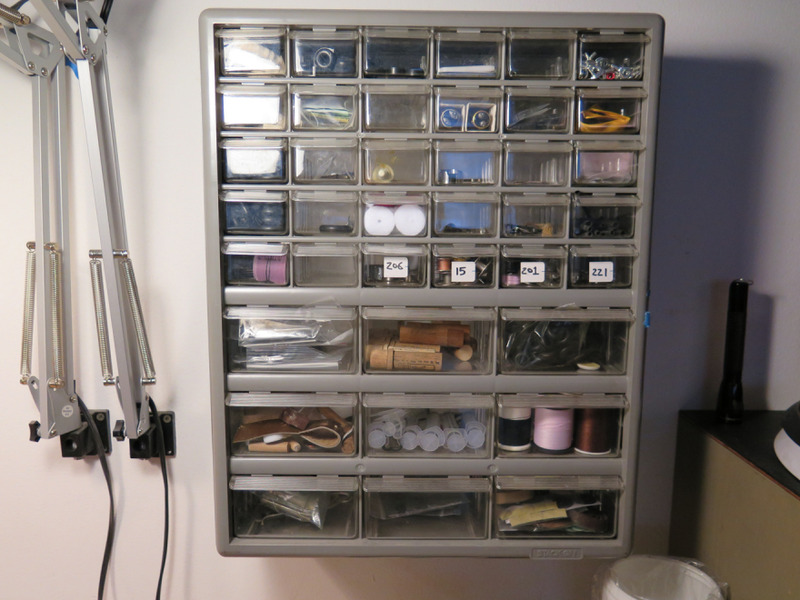 For pedestals I'm using four metal file drawer cabinets that I got for free on Freecycle. The benchtop is so heavy and unmoving that I did not even screw it into the drawers. 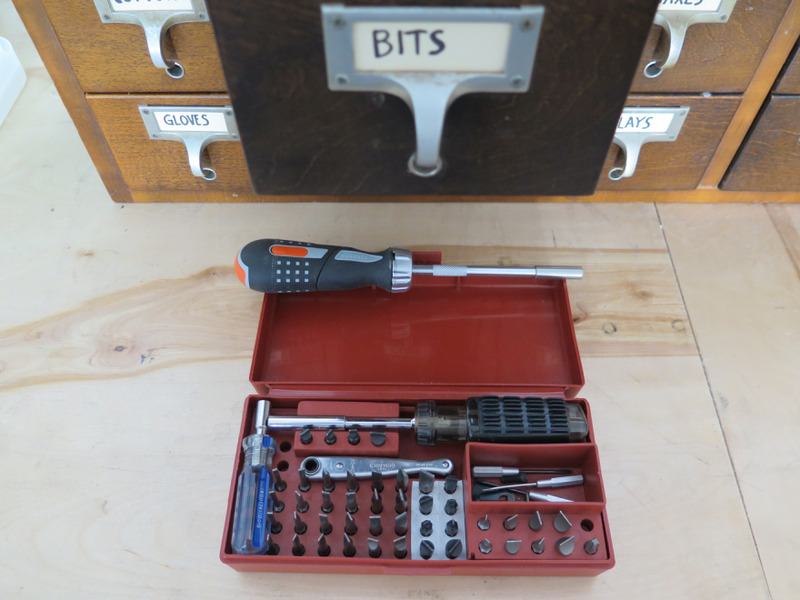 Tools and materials whose use is premeditated are all tucked away in the card catalog drawers. Tools that I often need in a hurry are stuck to the magnetic knife rack on the wall for easier access. The rack is located higher than ergonomic sense dictates, because there is often a machine sitting right underneath it and I need clearance space. Though I work sitting down, I don't mind standing to retrieve a tool. The swing-arm lamps are wall-mounted for clearance. 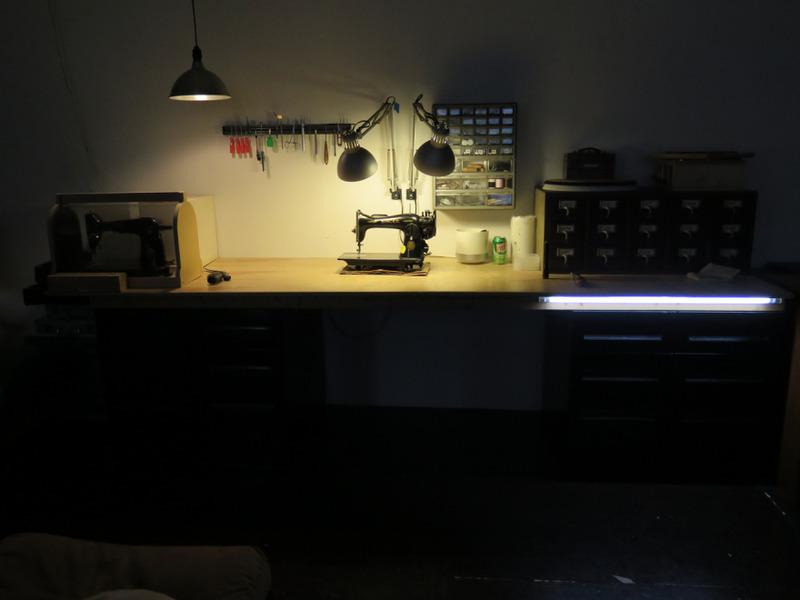 I often need to get light on the front of a machine, very close to some parts that have tiny screws, and this is the only set-up that works for me. Because of shadows cast inside the machine, two lights coming from two different directions are required. 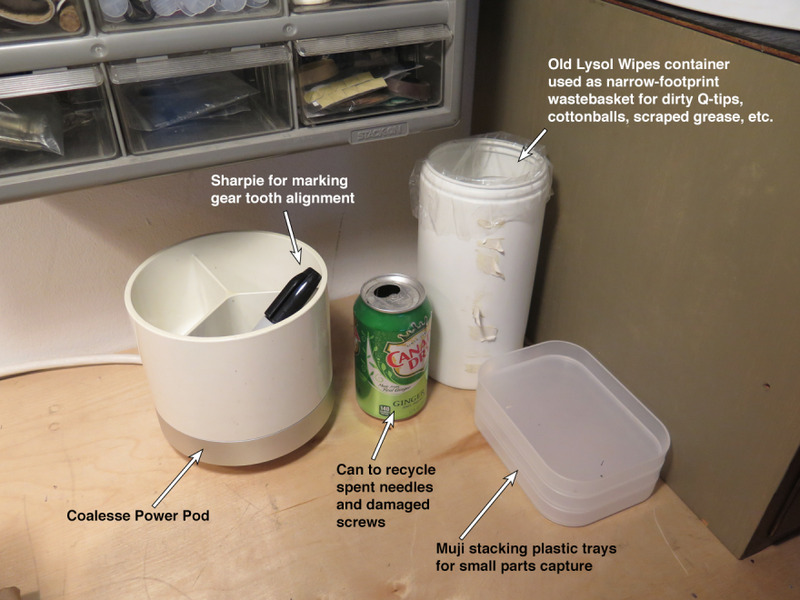 Cleaning old grease is messy work, hence the little desktop wastebasket. I use self-made clear plastic bags; in case I accidentally throw a screw or something I need in there, I can shake the bag and look through it instead of digging around inside to see if the part is there. 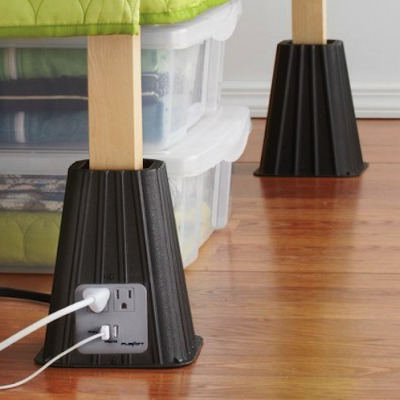 The Coalesse Power Pod is great because it tucks away under the circular holder. I need power on the desktop for when I'm testing motors. I can quickly hit the center-mounted Off button to kill the power if something goes wrong with the motor. 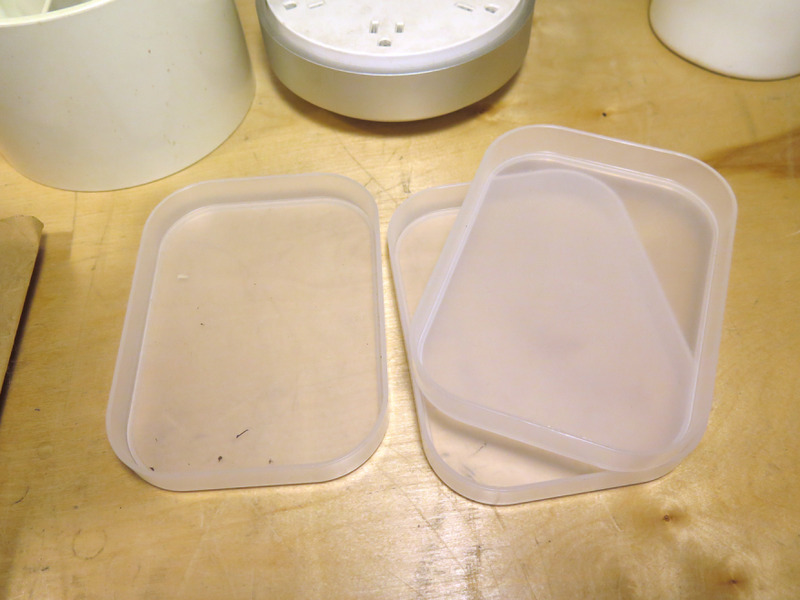 The Muji stackable trays are indispensable when you're removing a lot of small parts and need to remember the sequence they came off in; just put the first batch in the bottom tray, the next batch in the second tray, et cetera. They get dirty quickly but the smooth plastic is easy to clean. 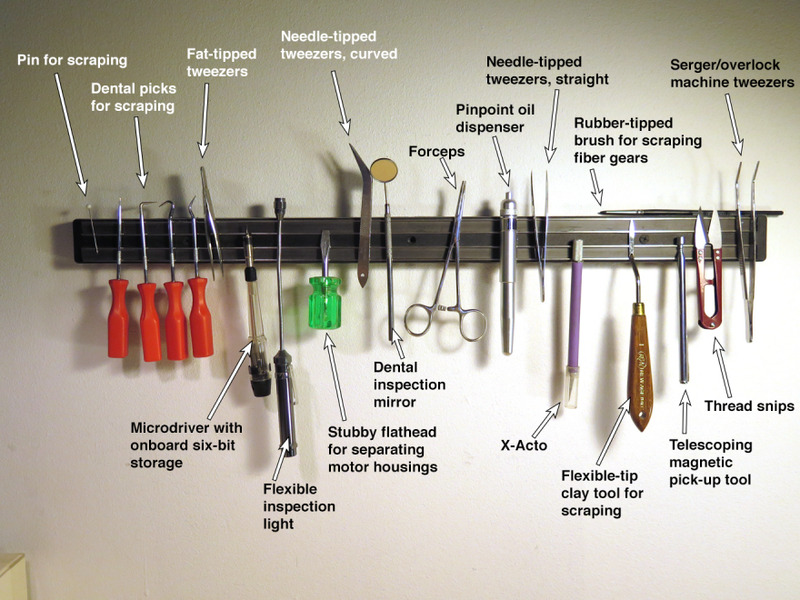 The magnetic rack primarily holds my scraping, inspection and grasping tools. I often grab and put them back in a hurry so they are in no particular order. 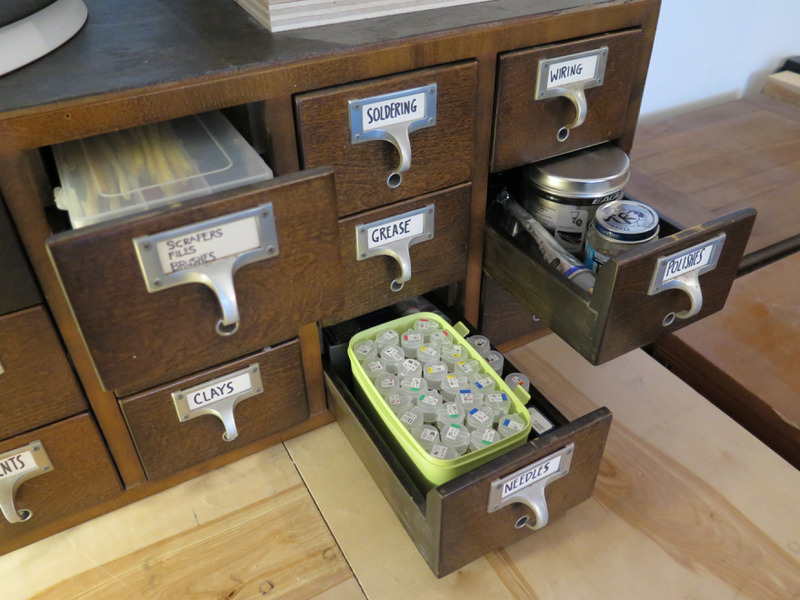 The Stack-On drawers are for those small random parts that defy easy categorization. 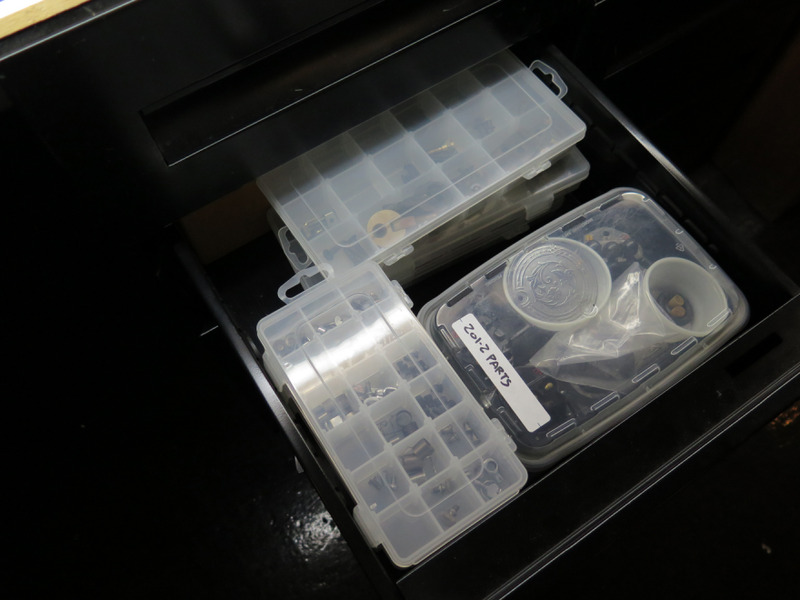 The clear drawers make it quick to easily find what you're looking for. 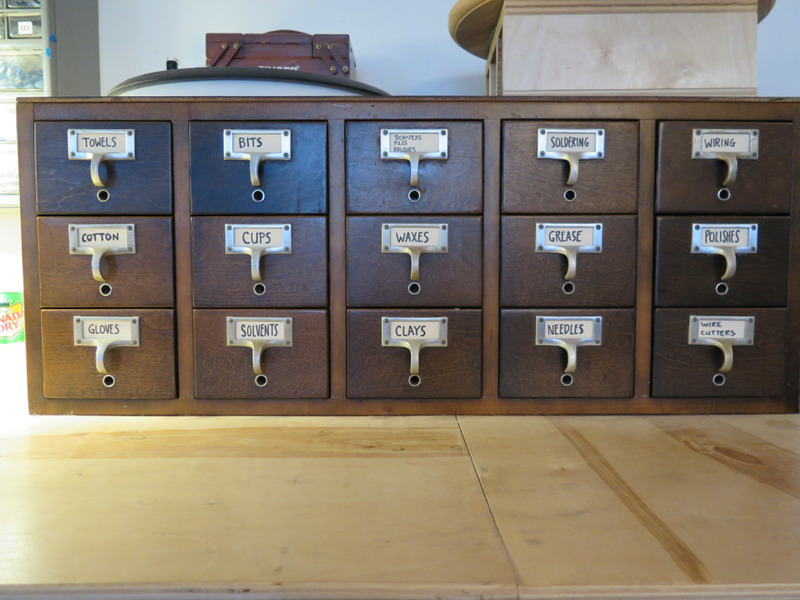 All of the tools/materials whose use is premeditated is located in the card catalog. 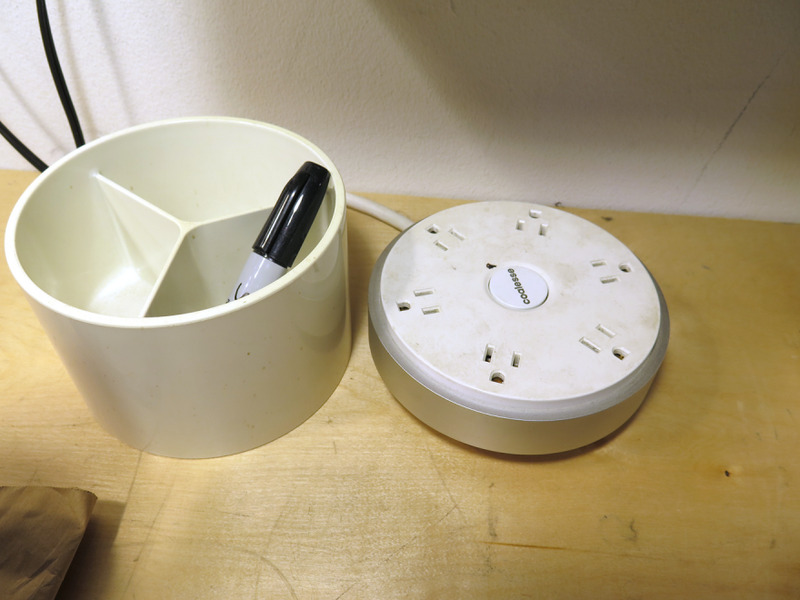 The drawer shapes are not ideal for holding differently-shaped items, but it's do-able. The heart of the "system" is my hollow-ground gunsmithing bits (made by Brownells) and assortment of drivers. The stubby driver and ratchet are essential for tight spaces, the medium driver is what I typically use, and the longer driver is for when I need more torque or ratcheting functionality. 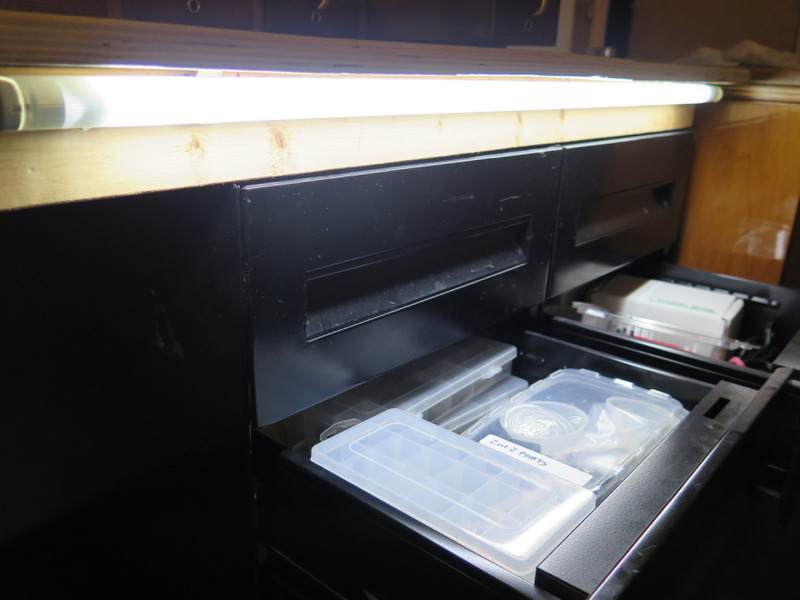 ...so I installed a fluorescent light over the right bank of file drawers, which hold spare parts. It's mounted beneath the front lip of the worktop so it doesn't cast glare into my eyes when I'm sitting at the bench. It makes it a lot easier to see into the drawers. 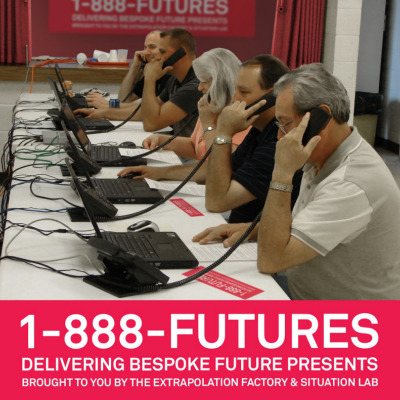 So, that's it for the sample entry. Think you can do better? Sure you can! 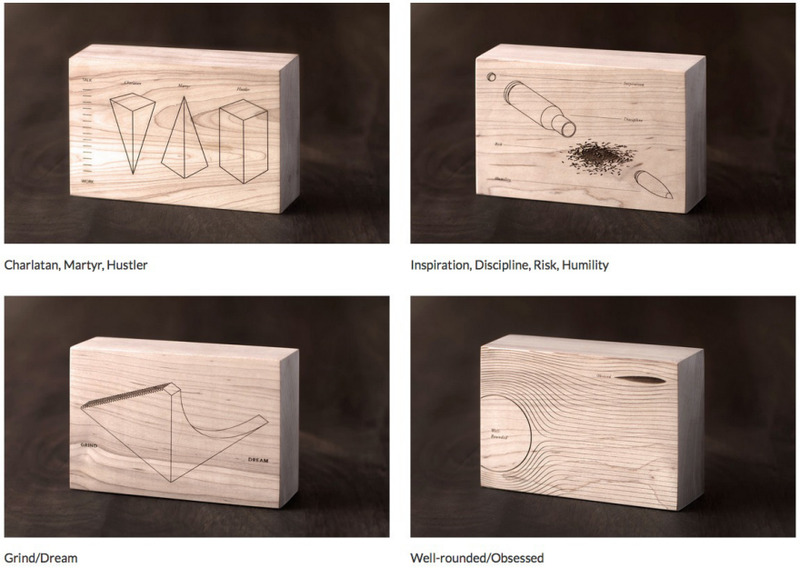 As part of his "Inspiration" series, industrial designer Joey Roth is producing a limited run of laser-engraved Eastern Hard Maple blocks. And these aren't like the other laser-engraved items you've seen; Roth and his production partner have achieved a stunningly fine, virtually char-free precision. The run will consist of just 1,000 blocks divided into four designs. 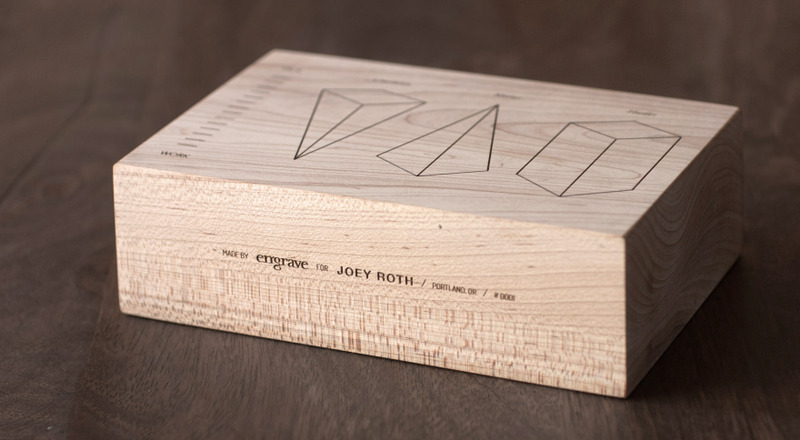 Out of each batch of 250, Roth is reserving #77--you know, for Core77--for the winners of the Workstation Challenge. There is no limit to the amount of images--or amount of workspaces--you'd like to enter, but please note that images should be no taller than 1,000 pixels, and no wider than 1,400. Deadline for entries is Thursday, October 1st and we'll announce winners on October 5th! I went through your instagram & website, I really love what you do, neat & elegant. Great work ! Thanks! 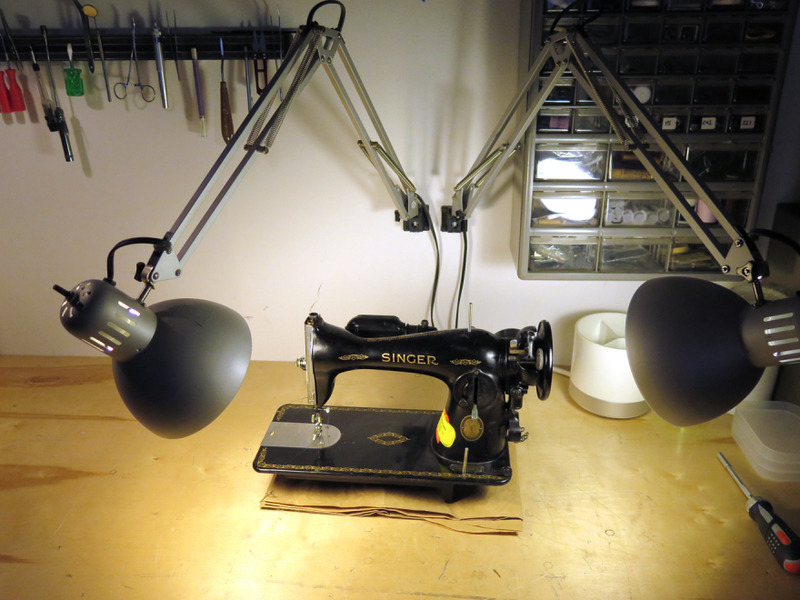 I love my job - even more than my old ID job :D.
How do you keep the IKEA lamps from sagging? Deadline for entry is this Thursday, October 1st and we'll announce winners the following week!